Not long after I finished spending some time with Amazon’s $199 Kindle Fire this week, Barnes & Noble shipped over a review unit of their new $249 Nook Tablet. I’ve only just opened the box and spent about a half-hour playing with the new Nook, and if you’re familiar with the prior model, you’ll see much of the same here. But there are some nice upgrades; particularly in the hardware department, with new a 1 GHz dual-core chip running the show. 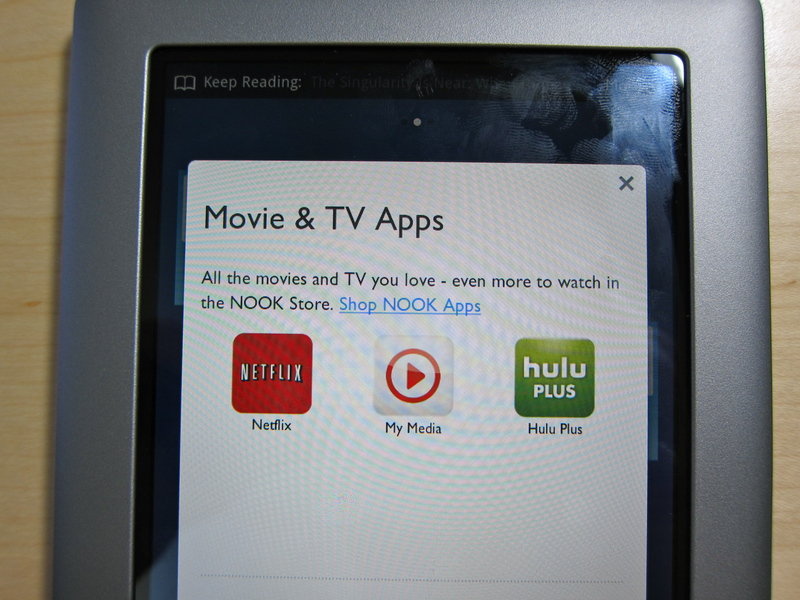 Just as with my hands-on Kindle Fire post, this isn’t meant to be a full review of the Nook Tablet. Instead, it should provide some early impressions on the device. The out of box experience is pretty good. A few steps to wireless connect and register the device, but its up and running in under three minutes; five if you watch the useful video introduction. Once running, any B&N books you previously bought are immediately available for download. The in-hand feel is really nice thanks to the excellent build quality and the slightly lighter weight compared the prior model. 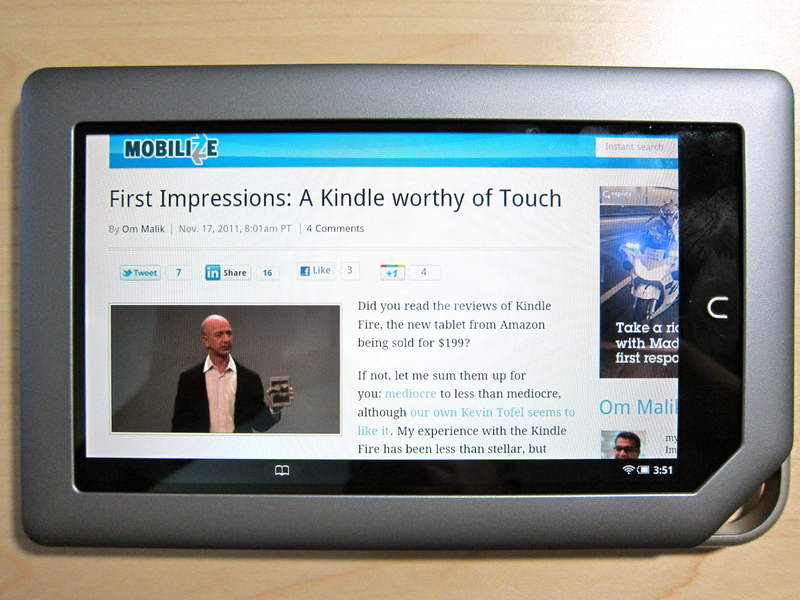 Thanks to rounded edges, it feels very comfortable to hold; even better than my 7-inch Samsung Galaxy Tab. 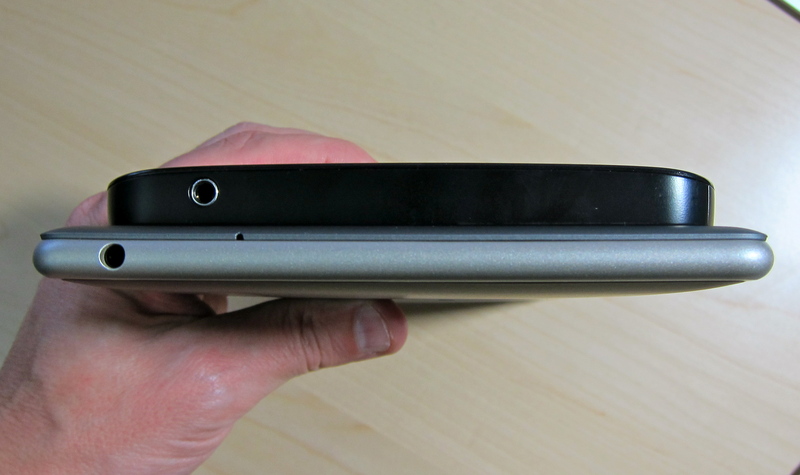 One issue for me: because the Nook is slightly wider than my Tab, it doesn’t fit as well in a back jeans pocket. Like the old model, the power button is nicely integrated on one side while two volume controls are on the other side. Neither is in a spot where you’d accidentally press them. Also similar to the old model; you won’t see any signs of Android. The customized interface is intuitive and fluid, plus you can easily modify items on the home screens, both in terms of where they’re located and what size they are. Even the device setting screens use the B&N custom interface. It’s well done. And can I just say I love the native font that B&N uses on the Nook? Some may like it, but I’m not a fan of having to hit the hardware button for some actions and the touchscreen for others. It feels disjointed to me, even though it’s the same method from the prior model. Scrolling and animations are fairly smooth, as I’d expect from a dual-core device. In fact, overall performance is solid. 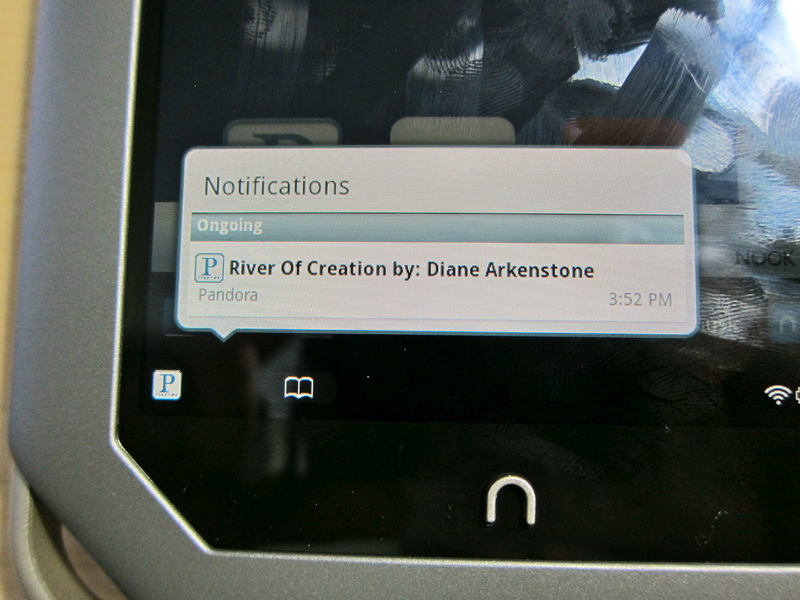 Notifications are seamless and unobtrusive. I like the 1024×600 resolution 7-inch display, which has an anti-glare coating. There’s still some reflectivity, but it’s minimized. The screen is plenty bright at 50 percent for me, but others may find it too dim. The touchscreen is responsive and works well, with little lag. The e-mail client supports multiple POP and IMAP accounts, but doesn’t support Microsoft Exchange. The help information suggests using a third-party app if you need Exchange. Although there’s just one speaker in the back, it’s not bad, provided you turn the volume up fairly high. I can use this tablet for music or video without headphones, provided there’s not much background noise around. Watching a Netflix video was no different from any other 7-inch tablet I’ve used in the past: It works well after some initial low-quality buffering playback and has the new Netflix storefront, which I think is a huge improvement. 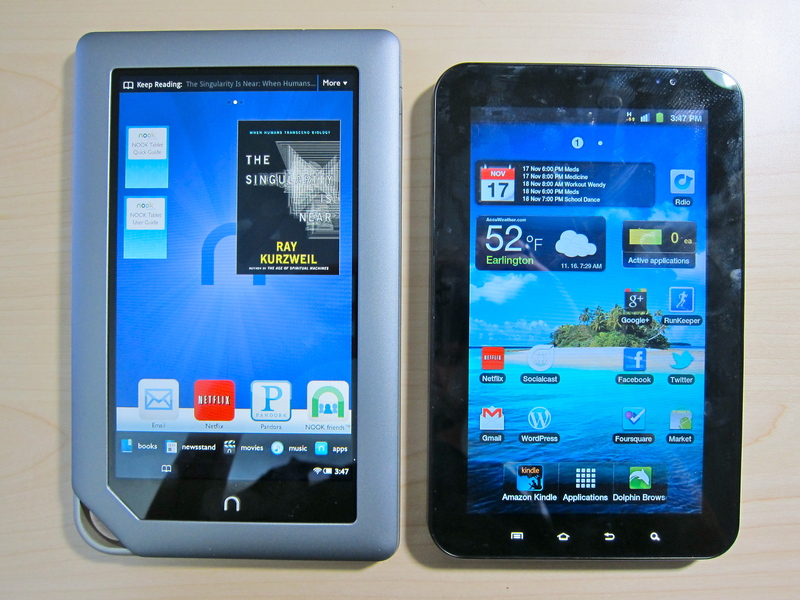 The reading experience is little changed from the prior Nook and that’s good. It’s easy to modify setting such as font sizes, spacing, etc. You can take notes, look up words in the dictionary and share quotes via Facebook or Twitter. Speaking of Facebook and Twitter, neither official app is in the Nook app store, but Seesmic works well. I hope that B&N gets both of these native apps in the store, but maybe others won’t mind. I’m a fan of the software keyboard, finding plenty of spacing between keys. But even though I have the keyboard set to correct commonly mis-spelled words, I don’t see it doing so; at least not in the native email app. Nor does it offer suggested words as you type. Browsing the web offers a relatively fast experience. It’s not as fast as the iPad 2, for example, but will be seen as capable by most and I’d have no problems using this browser while away from a laptop or desktop. 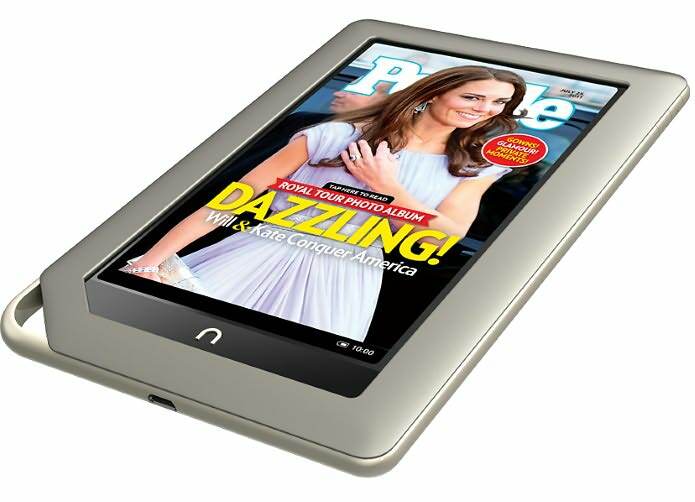 For $50 more than Amazon’s Kindle, the Nook Tablet offers a similar package with double the memory: 16GB on-board, plus microSD expansion support. But it lacks a native store for music and video, although I was able to watch a video rental from YouTube on the web. Which is the right device for you? That depends on your budget and your needs, but I’ll try to answer that question in a head-to-head follow-up soon, so stay tuned!